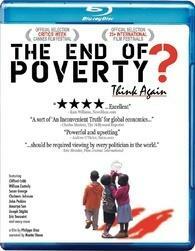 Overview - Narrated by Martin Sheen, The End of Poverty? is a daring, thought-provoking and very timely documentary by award-winning filmmaker, Philippe Diaz, revealing that poverty is not an accident. It began with military conquest, slavery and colonization that resulted in the seizure of land, minerals and forced labor. Today, global poverty has reached new levels because of unfair debt, trade and tax policies -- in other words, wealthy countries exploiting the weaknesses of poor, developing countries such that today 20% of the planet's population uses 80% of its resources and consumes 30% more than the planet can regenerate. From award winning director Philippe Diaz, the documentary film 'The End of Poverty?' attempts to examine the origins behind our current global climate of inequality in wealth and resources. Through interviews with various experts, authors, professors, and economists, as well as looks into current poverty stricken areas such as Bolivia, Brazil, and Kenya, Diaz weaves an expository lesson on the pitfalls of greed, imperialism, and skewed economic policies which attempt to control nations through debt and monopolies. While the content itself can be thought provoking, the manner in which the filmmakers present their argument is disappointingly dull and one-sided. The documentary is essentially structured as a series of talking head interviews with several supposed experts along with narration from actor Martin Sheen discussing the creation of global poverty starting in 1492 and carrying through colonialism and the slave trade. In addition, the filmmakers examine the lasting effects of these inhumane actions by spotlighting several areas currently suffering from deficient resources, miniscule wages, and corrupt control. Though the content itself is certainly worthwhile, the main problem with 'The End of Poverty?' is the method in which the filmmakers have decided to form their case. There is very little attempt at any kind of artistic expression here, instead, the proceedings amount to little more than a series of statistics, history lessons, and theorizing. Though there is some level of emotion achieved through the documentary's occasional detours to areas like Kenya and Brazil, showcasing actual human beings struggling to survive on inconsequential wages and little resources, the time spent with each participant is far too short to make much of an impact. The overly academic approach taken, ends up delivering the film's ideas in such a clinical manner that it robs this potentially powerful topic of any actual resonance. With this more straight forward approach, however, the movie does avoid certain manipulative methods that other politically charged documentaries tend to fall victim to. With that said, the film is still disappointingly one-sided offering no other possible options or opinions than the ideological ambitions of its director. The varied participants all weave the same overall narrative with no dissenting viewpoints, and the movie's anti-capitalist sentiments could certainly end up rubbing many the wrong way. In addition to the film's tediously educational style and one tracked agenda, the documentary ends up lacking much of a final message. Sure, the movie does a decent enough job of tracing the potential reasons behind poverty, by drawing historical parallels and connecting misuses of trade, debt, and economic policy, but at the end of the day, most of these links are rather obvious and simplistic and the film does very little to address how one could actually fix the problem. We may now know, but as a famous group of proud patriots once said, "Knowing is half the battle." With only some small hints as to how we could go about addressing the issues examined, the movie ends up accomplishing very little beyond a rather dull and slanted history lesson. 'The End of Poverty?' does make some interesting points and is somewhat effective when dealing directly with the living subjects of its topic, but ultimately this is a rather cold look at a very emotional issue. By merely spewing (somewhat debatable) facts and statistics that attack the methods that got us here in the first place, the filmmakers seem to be missing the greater point. Still, despite its uninteresting style, there is value in the analysis presented, though many might be put off by the film's specific political leanings. 'The End of Poverty?' is brought to Blu-ray by Cinema Libre Studio on a BD-25 disc housed in a standard case. Some skippable trailers play upon startup before segueing directly into the feature. The film is presented with a 1080p/AVC transfer in the 1.78:1 aspect ratio. Unlike many documentaries, the movie seems to come from a consistent high definition recording source. Noise is visible from time to time, but is never distracting. Detail is pretty good in both the talking head interviews and the on location footage in various impoverished nations. Depth, however, is mostly absent. Contrast and black levels vary quite a bit from shot to shot and location to location, sometimes appearing blown out and elevated, and other times appearing more natural. This isn't an impressive looking film by any means but for a documentary feature, it's more than serviceable. Considering the shooting conditions and budget, this is probably as good as the material could hope to look. 'The End of Poverty?' is provided with a standard Dolby Digital stereo track that features a variety of spoken languages throughout. Optional English subtitles are included. Dialogue is mostly crisp, with Martin Sheen's narration coming through strong, but there are some minor crackles and pops with some of the on location interviews. Directionality is mostly absent, though some of the music used does feature some nice stereo separation. Dynamic range is flat, but the score does offer a tiny bit of bass activity. Balance between elements is good, placing emphasis appropriately on the various participants. This is essentially a purely functional track that respects the material it presents. It gets the job done cleanly without any major technical issues but certainly isn’t impressive in any way. Cinema Libre Studio has put together a nice assortment of supplements, many of which are exclusive to the Blu-ray, though they mainly just offer more of the same dry rhetoric featured in the film. All extras are presented in 1080p with Dolby Digital sound and no subtitle options unless noted otherwise. Extended Interviews (HD) - Several extended interviews with the experts featured in the film are presented here. Those included are John Perkins (5 min), Heather Remoff (3 min), Joshua Farley (6 min), Mason Gaffney (5 min), and HWO Okoth-Ogendo (7 min). Topics expanded upon include colonialism, economic hit men, effects of land taxes in Brazil, and how US companies gain control of land overseas. For fans of the documentary, what you basically get here is more of the same lecture like material. Stawi Youth & Adult Center Profile (HD, 7 min) - This is a brief look at the Stawi center in Kenya which helps HIV positive individuals and tries to educate the youth of the area on the disease. The participants talk about the struggles to get government funding and the stigmas they must deal with in society. Phillipe Diaz Interview (HD, 50 min) - This is a pretty comprehensive 2009 interview with the director of the documentary. Diaz comes across as a little smug but knowledgeable and discusses the reactions to the movie, his goals while making it, and his experience on the film festival circuit. He also expands upon some of the issues addressed in the doc and remarks that he felt the subject matter of the film was too serious to take a more cinematic approach (I disagree). Trailers (HD) - Several trailers for other Cinema Libre Studio releases are included. 'The End of Poverty?' is a fairly dry and impersonal documentary that attempts to address the origins of poverty. While it does make some interesting points, and manages to spotlight a few meaningful examples of injustice, its one-sided and clinical approach holds back the film's impact. Video and audio are serviceable and while plentiful, supplements are just as dull and politically slanted as the feature. Even with its faults, this may make a decent rental for some.